Over the last few weeks blogging has taken a bit of a backseat in life. Something that is both nice and yet unwanted. Part of me has felt like I have had little of worth to say while the rest of me has been screaming for the clarity that typing away in the still of the night brings me. A clarity that is actually found at any time I make the time to write though more often than not that time seems to be long after the sun has gone down. I am always thankful for any time I get to sit and be with my thoughts. Preparations for #ouradventureofalifetime are well and truly underway in swinging into full action. My kitchen has been removed and hopefully before long a new one will be installed. Since we organised a skip bin for the kitchen rubbish we decided to start going through all our belongings and see what else could be thrown away. 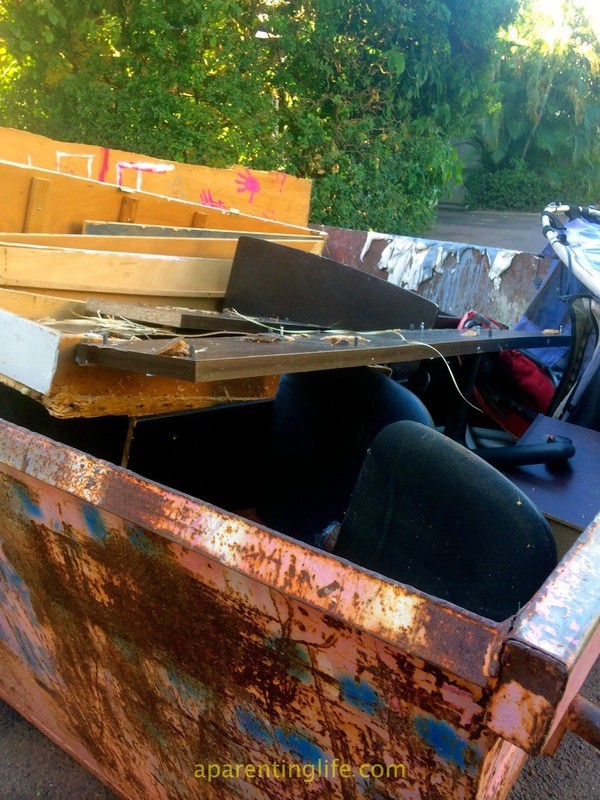 An old couch, a wobbly bookcase and a wonky desk were top of the list. I am thankful to be decluttering, regardless of how hard I find it at times. I am even more thankful for my wonderful mother and her ruthless disposal skills. Deep down I know this is all for the best and it is stuff that we no longer need and quite possibly haven't needed for quite some time, but that doesn't always make it any easier. I am a keeper and a collector at heart. You just never know what it is that someday you may need. When it is all done and dusted and we return home I know I will be thankful for all the extra room I am creating to start collecting again. On Saturday night Mr Awesome and I treated ourselves to a child free night. We figured it would be our last for quite some time. The fact that Dave Hughes was in town made the decision even easier. I am thankful we were able to get tickets to the show. I am thankful that mum was happy to have the girls for a sleep over. Especially since Zany had been less than well the day before and Teapot appeared to be following suit. I am thankful she held it off for a day or two. Poor mum does not cope all that well with spew. Thinking we were doing the right thing, we caught the bus into town. Given a drink of two was most certainly on the cards. I am thankful the first restaurant we walked into was too full to squeeze us in. It made us go to another. One that is spoken much more highly off as well. I am super thankful they could squeeze us in before the show. When we were done Mr A went to go and pay the bill. Only to discover his wallet no longer sitting snuggly in his back pocket. I am thankful that due to my ATM card being eaten by an ATM earlier in the week I had Mr A's card safely in my purse. A few quick phone calls and cards were blocked while we desperately hoped for the wallet to be found on the bus. Hughesy was hysterical to say but the least. Though I think the highlight for me came when he favourited my tweets! Sadly it turned out that the wallet was not found on the bus. It looked promising at first as a few wallets were found that night. Just not one belonging to Mr A. By Monday lunchtime he decided to check in with the police station. Just in case it had come their way. It hadn't and by now it was starting to feel like all hope was lost. There was no money in there, not a cent at all. Just lots of cards to replace. Mr A had no sooner returned from reporting it with the cops when his work received a call to say the wallet was found. Thank goodness for business cards and honest people around. A lady had seen it at the bus stop and picked it up! Thanks does not even begin to explain how we felt that night. Thank you dear lady for making the world seem right. What thanks do you have to share this week? Papaya, pawpaw we all cry more, more! Excuse me while I wallow just a little. Or a lot.